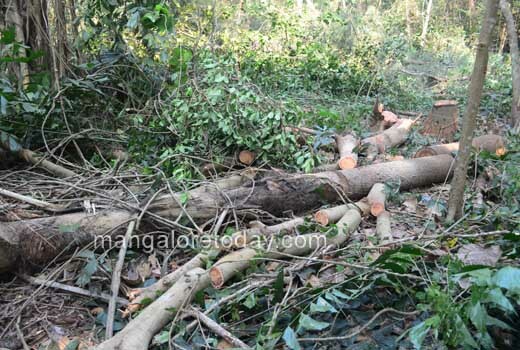 Mangaluru, Jan 11, 2018: Forest Department officials began cutting trees for the proposed DK DC offices complex at Padil on Jan 10, Wednesday. There was strong police cover around the area. The Tree Officer, through an order on Jan 9, Tuesday, allowed to cut down 202 trees for the project coming up on 5.89 acres. There are more than 660 trees in all on this site. Permission is not required to cut down 124 trees. 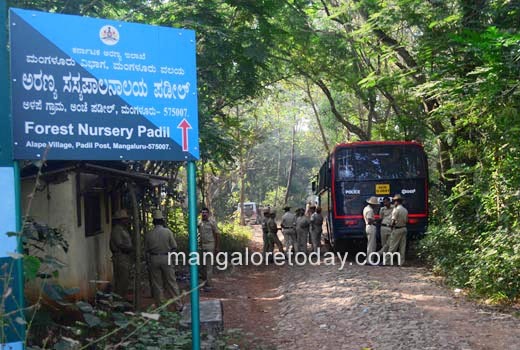 Getting permission to fell them has been exempted under Section 8 of the Karnataka Tree Preservation Act. 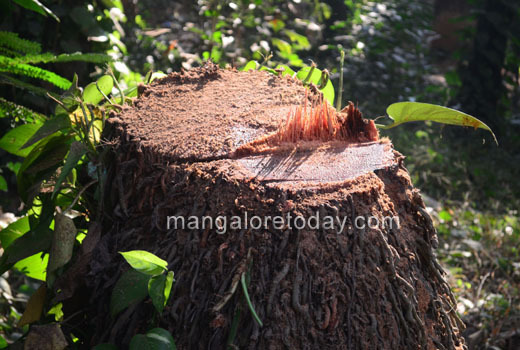 The officials are cutting down those trees which have been exempted under the Act. 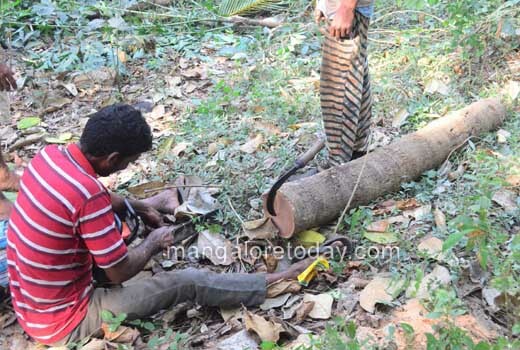 A team of forest officials, led by Alexander, Deputy Conservator of Forests, Karnataka State Forest Industries Corporation (KSFIC), P. Sridhar, Range Forest Officer, Mangaluru, started work before 9 am. 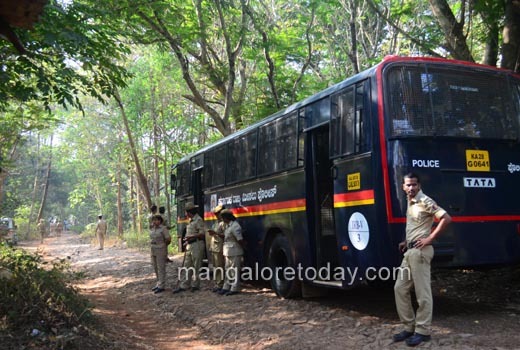 The city police and the Karnataka State Reserve Police personnel have been deployed in large numbers to prevent any untoward incident. 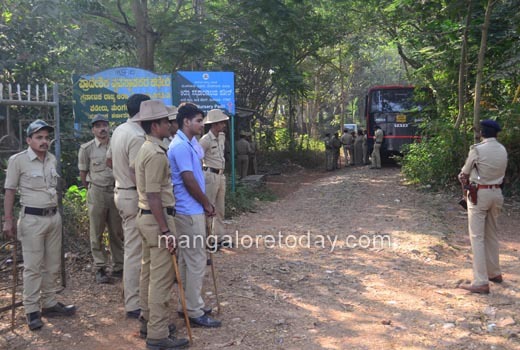 Personnel from Mangalore Electricity Supply Company Limited were also present on the spot. Two batch of workers were deputed to cut down 124 trees. Mr. Sridhar said that after felling 124 trees, the other 202 trees would be cut to enable the project to come up. Of the 10.09 acres of land that belong to the KSFIC at Padil, the government transferred 5.89 acres to the Revenue Department on November 14, 2014 for the project. The Tree Officer passed the order after conducting a public hearing on January 4 on an application by the DK DC seeking permission to cut down trees for the project. This application was filed following the dismissal on December 20, 2017 of the petition filed by activist Suma R. Nayak before the National Green Tribunal (NGT) challenging the move to cut down trees for the project. Following the dismissal of the petition, Ms. Nayak filed a miscellaneous petition which will come up for hearing on January 22.